Hello SixPrizes.com, this is my first ever time submitting a report and, fittingly, my first time participating in a premier event. I have only recently got into the game so I expected to be decimated and this idea was backed up even more when I arrived because everyone told me my deck was going to lose; what a great way to start. The tournament was held in a library, and as we walked in to a room of only 3 other Pokémon players, I knew I had a bit of a wait until we actually started. I took this time to review my deck and look for any changes to be made before doing a decklist. Luckily for me our TO’s son, Adam, gave me some advice and a friend lent me the 2 Night Maintenance I needed to give me control of the discard pile. I was playing a Ampharos/Dialga G Lv.X deck which has absolutely no synergy whatsoever but I have been collecting in the modified format for 2 months so it was the best I could do. 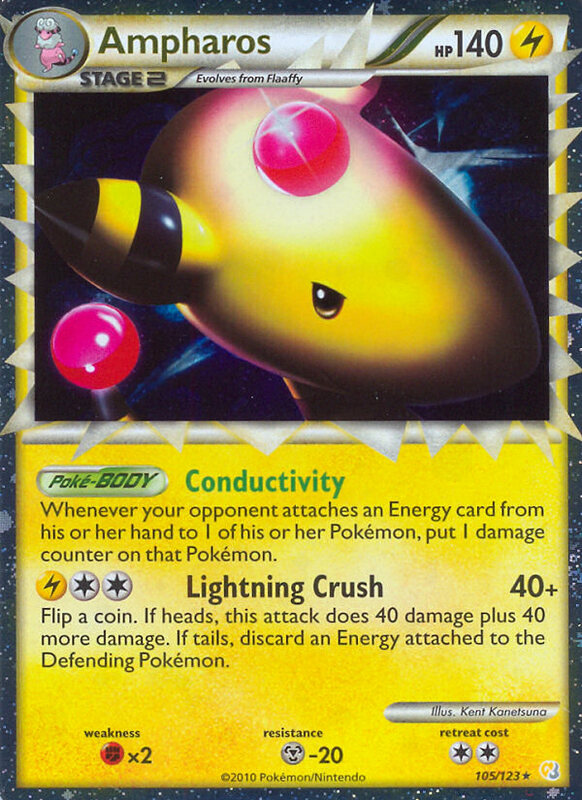 It focuses on disrupting your opponent while you set up and ending with Ampharos or a Dialga G with 4 Special metals and “Remove Losting” for the game. I don’t have a decklist on me but if you guys want it then drop a message in the comments and I’ll review it for the end of the week provided it gets posted. So with my deck ready all that was left was to sit around for the time that was left boasting of our Pokémon video game achievements and, in some cases, moaning at people for not bringing a Kecleon deck. I talked to some people and joked around until our TO asked us to pair up. The rounds were to be best out of three each and there was a top cut of 2 for Masters and Seniors. Now I’m afraid I can’t remember this guys name but he was an awesome player and I think he went on to take first place. So we said hello and shuffled our decks. I started with a Mareep and Baltoy to their Ambipom G and Dialga G They went first and I was instantly on alert as I really didn’t want to start my first turn 1 prize down but luckily they only attached a Call energy and got a Baltoy (I think) and Garchomp C. After my first scare I proceeded to set up a Claydol and 2 Ampharos (1 Prime, 1 PL) We started off hitting for bits of damage, me tanking with Ampharos them switching and Poké Turning Garchomp C’s to avoid and heal damage. 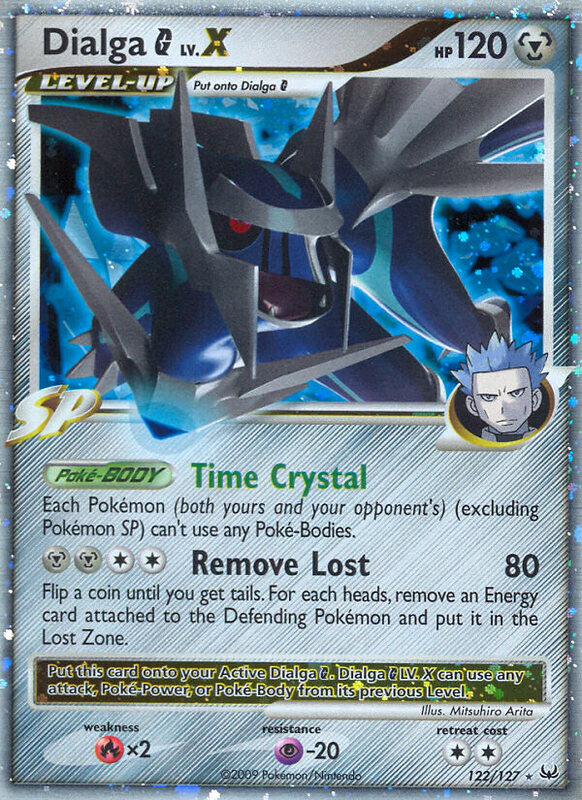 Eventually I started taking prizes with Dialga G Lv.X, however my opponent too had a few at this time. I took out their Uxie Lv.X and Ambipom G after they had messed with my Energy to finally get us even. They then brought up Garchomp C and dropped a DCE and Energy Gain to “Earthquake” my Dialga G Lv.X and take it to 4-3 with shots at taking it to 4-2 with a snipe. 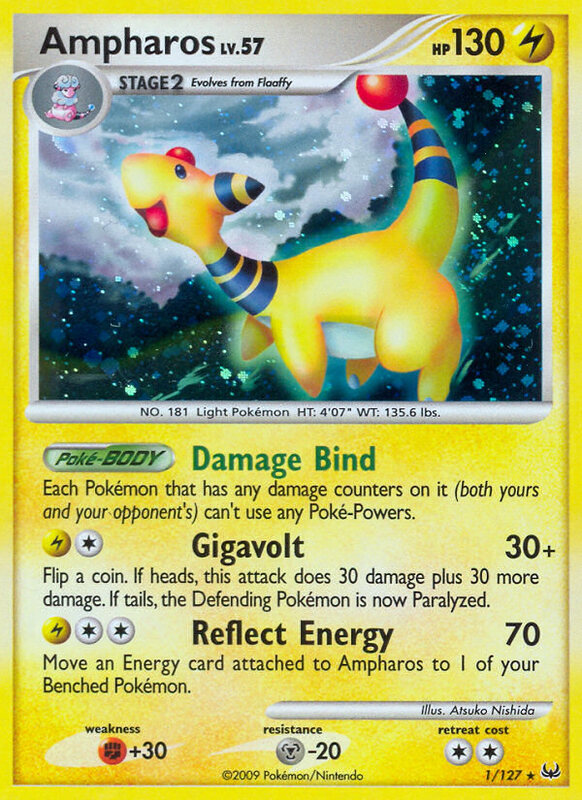 I desperately searched through my deck for any way to come back and ended up attaching energy to power up my Ampharos Prime and was just about to pass when time was called. We were both pretty unsure what to do so we asked out TO and he told us if I had taken 1 more prize we could have gone to sudden death or have it judged by the field but as it was he took the win. I have a mild feeling they had run out of Poké Turns, but they deserved the win and expertly played their deck. So I was 0-1 and felt that my deck had played far better than anyone expected it to and I had lasted a whole half hour against a great player with a great deck. So I prepared to take on round 2. Ben told me he wanted to play a Kecleon deck at the beginning of the round but didn’t have the cards so he had to play Gengar. 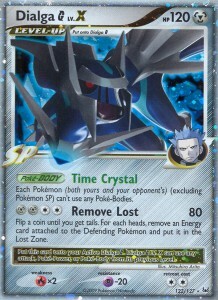 Despite this he still boasted about how good his deck was and what his Gengars could do. I again started with a Mareep and Baltoy while he started with a lone Ghastly I knew I couldn’t get the donk so I started to set up an Ampharos. I set up faster than them and started taking prizes while they were still getting started. I took a prize or 2 then they hit me with “Poltergeist” with an Expert Belt for 140 damage. Not as good as the 300 they told me they got last round but still a pretty huge amount. I hurriedly rid my hand of trainers and hit them as hard as I could. They tried to “Poltergeist” again, but only got 50 damage while I got the knock out and avoided Fainting Spell with “Damage Bind” they had also put the Lv.X on it so I was ages ahead and I took the rest of the game with Ampharos and Ampharos Prime and Dialga G Lv.X. I had 1 scare when I had an Ampharos PL with 120 damage on it and poison, but with some expert Super Scoop Uping I avoided the KO. Game 2 I really can’t remember all I know is that time was called before either of us got a setup and I took the round. I was at 1-1 now and all that was left was losses in my eyes. I joked about and prepared for round 3; I had 1 win which was all I had needed and was ready for anything. I was paired with Gengar again so I was pretty confident, but their opening of a Spiritomb and Ghastly scared me. I began setting up and quickly hit their Spiritomb down to 10 HP. they brought up a Gengar and used “Poltergeist” for decent damage, but I cleared my hand of trainers and hit them hard with Ampharos’ “Reflect Energy” moving Special Metal energies onto my Dialga G. After I disposed of their Gengar they couldn’t set up again and I took round 1. In game 2 they got a rubbish start to my decent one and as soln as I set up a Ampharos Prime I sealed the match hitting their Crobat G’s for weakness and KOing other basics which made the game pretty quick. I felt a bit bad about his frustrating draws, but after the initial annoyance went we started chatting and he commented on my deck, the first compliment it got all day as well as the last. 2-1 and there was no way I couldn’t lose more than I won. Life was good and this tournament was better. I headed into my final round wondering about top cutting. We were both 2-1 so we knew this was going to be a good round. He had a decent start to my lone Dialga G which was terrifying as I had a weakness to him, but I quickly got a Baltoy and Mareep in play and started setting up. He got his first Magmortar and started hitting my Ampharos Prime, but I got the energy discard to stop him KOing me next turn and went on to hit it for the KO the next turn. We traded prizes and I brought out my Dialga G Lv.X to prevent him from healing when he dropped energy and from then on things started to look up for me. I ended up hitting for 70 each turn and powering up my other Ampharos. My opponent got KO’ed faster than he could set up until I finally took the match. While we were setting up match 2 time was called and I took my third win of the day. 3-1 and I was dreaming of top cut already. Sadly, I didn’t make it but I did come third and win a couple of HGSS packs and pulled an Ampharos Prime which was pretty cool. I traded around and watched the seniors top cut a bit. It was Ben with Shuppet vs the guy I faced first round. I left it at 1-0 to the first guy as he Dialga locked Shuppet. Ben for lending me 2 Night Maintenance. Still Ben for faking a Seribii Page to show Pichu with Dynamic Punch to trick someone. Adam for fixing up my deck before I started. Ben for filling up his bench playing Shuppet Donk. My brother for not coming. Nice first showing. It sounds like you built a fairly good deck and played it well. Great job for a first premier event!!! Thanks for all the positive stuff guys. And @ Curiouse1Icon I will write a review of how my deck worked as well as showing other good strategies I think the deck could use. Good job for your very first premier event and nice write up. I would also be interested in seeing your list to give you some suggestions. Not sure it's a real solid deck in the long run though, you might want to invest in some different cards. Dialga G and Ampharos is definitely an interesting combination. While shutting off your bodies is usually not a good idea, it might be nice to escape your own power-lock if needed. Hey admin, quite informative blog post! Pleasee continue this awesome work..